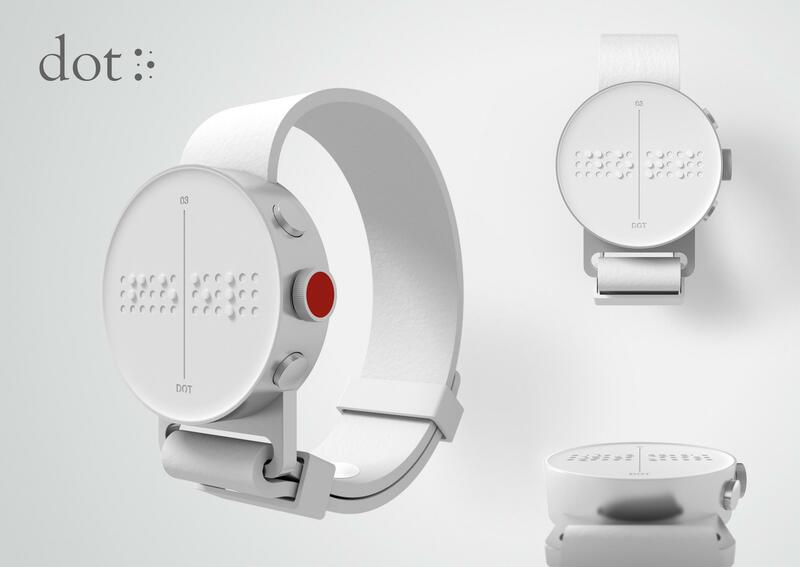 The DOT Braille Smart Watch project has won the Grand LIA for Design at the 2016 London International Awards. 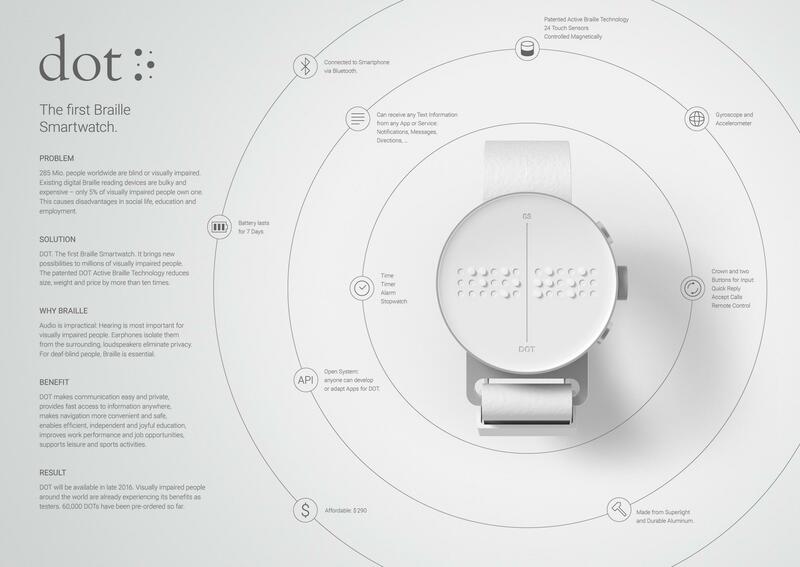 Developed in South Korea, DOT the first Braille Smartwatch sets out to provide an interactive device for blind and visually impaired people, to be launched later this year. Online at dotincorp.com, the patented DOT Active Braille Technology reduces size, weight and price by more than ten times compared to existing digital Braille reading devices which rely on piezo-electricity. B&VI people can benefit from DOT in all areas of life: DOT makes communication easy and private, provides fast access to information anywhere, makes navigation and transport more convenient and safe, enables efficient, independent and joyful education, improves work performance and increases job opportunities, supports leisure and sports activities. 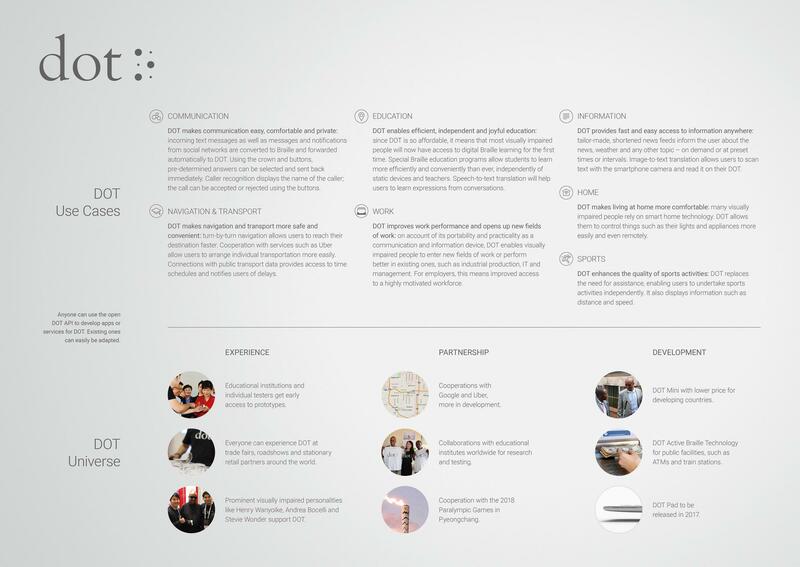 Through the open DOT API, anyone can develop apps or services for DOT. Existing ones can be easily adapted. Apps for Braille education, social networking, navigation, newsfeed, weather and many more are already in development. DOT is connected to the smartphone via Bluetooth and can receive any information in text-form, from any app or service – e.g. notifications, texts, directions. It has a crown and two buttons for input – e.g. quick reply, accept calls, remote control. 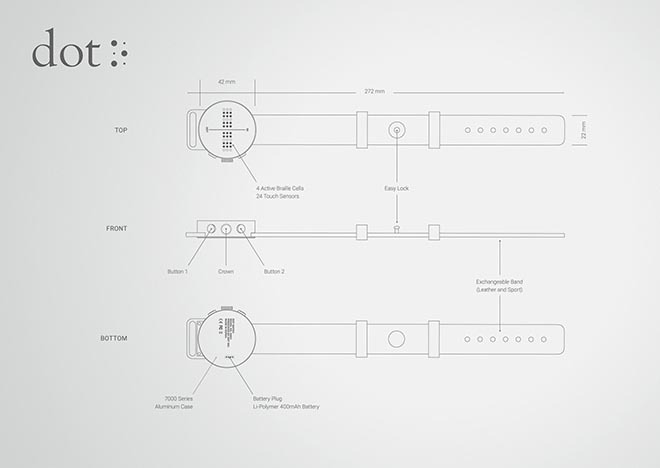 DOT comes with full smartwatch functionality: time, timer, alarm, stopwatch, gyroscope and accelerometer. It’s made from superlight durable aluminum, the battery lasts for 7 days and it costs $290. DOT’s patented Active Braille Technology is based on solenoid multi-actuators controlling four Braille cells with 24 pins by magnetism instead of piezoelectricity as in other Braille devices. This reduces size and production cost, increases speed and keeps energy consumption low. DOT uses haptic force feedback technology to detect finger movement on the pins and automatically change the pins to show the next characters. Along with software, this makes it possible to display text rapidly and conveniently even with limited Braille cells. 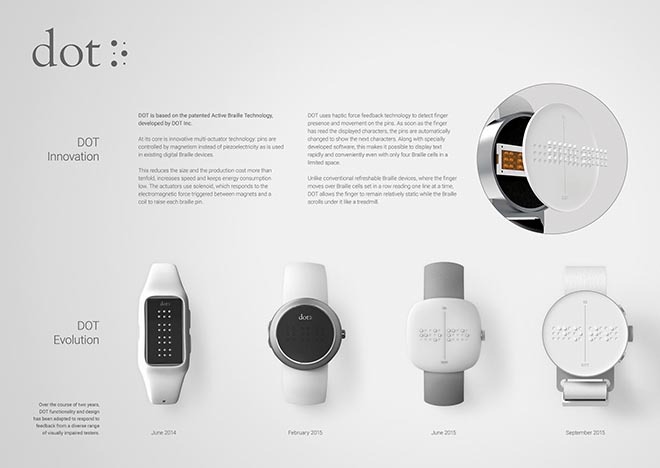 The DOT Braille Smart Watch was developed at Serviceplan, Munich and Seoul, by global chief creative officer Alexander Schill, executive creative director Bill Yom, creative directors Franz Roeppischer and Lorenz Langgartner, copywriter Rohan Vitus Fernandes, art directors Azim Abasbek, Kostiantyn Liakhov and Henning Janzen, graphic designer Jung-Seok Lee, creative operations manager Diane Schulz, working with Dot Incorporation head of client services Eric Ju Yoon Kim, account director Ahrum Choi, brand manager Susan Kim, and innovation Per Juul Poulsen. Post production was done at NHB NEXT, Hamburg, by animator Lennert Schrader, editors Dennis Fritz and Isabelle Fournet. Sound design and music were produced at Augleo, Seoul, by sound designer Woo Kyun Jang.